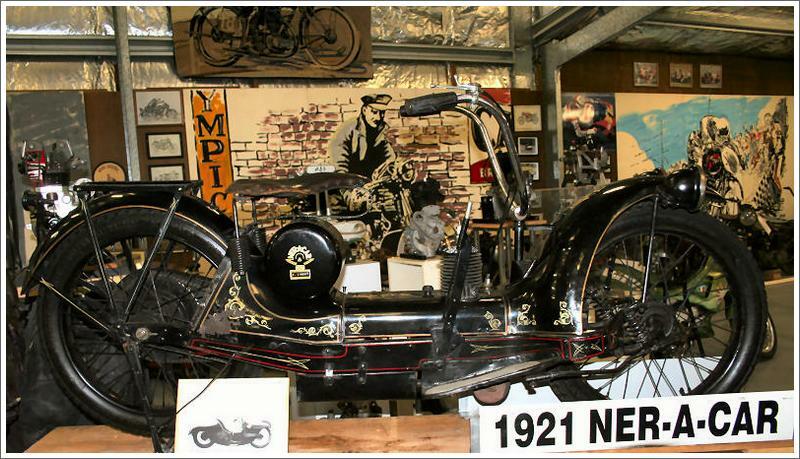 Designed by American Carl Neracher during the First World War, these unusual machines were built first in England and then later also in Syracuse, New York. They featured a low-slung steel chassis with hub-centre steering and transmission by friction drive to the rear wheel on early designs. The steel chassis, which was more like that of a car, housed two-stroke engines of 221cc and four-strokes of up to 347cc in sv and ohv configuration. The design met some resistance in the United States and in 1919 backing was found in Shefield, England where the Simplex company agreed to build the machine for Britain and its colonies, excepting Canada. Simplex began production in 1921, and the following year backing was also found in the USA where the first machines left the Ner-a-Car Corporation's Syracuse, New York factory. In 1922 the strange little contraptions were soon the talk of the town after Cannonball Baker rode one coast to coast, NY to Los Angeles, in 8 days. He spent 172 hours in the saddle, and averaged 30mph. He stayed off the freeway.